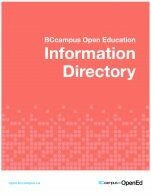 The OER Research Toolkit is comprised of the OER Research Guidebook and several additional resources, including surveys for both students and instructors who are using OER in the classroom. 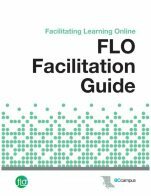 The purpose of this guidebook is to provide ideas for how individual faculty members and those who support them (e.g., librarians, instructional designers, etc.) 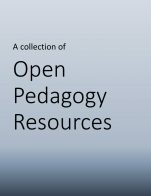 can research the effect of their adoption of open educational resources (OER). Clearly educational research is a challenging enterprise; this guidebook is not meant to replace the substantive courses and experiences that a PhD in educational research would provide. Rather, our hope is to provide some straightforward suggestions that could be implemented by OER adopters so as to help them identify what has happened as a result of their OER adoption. 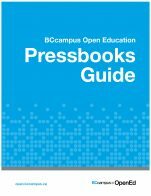 This is a creation of the OER Research Guidebook and was generously supported by the Open Textbook Network. This cover is by the authors and is released under a CC BY 4.0 International license (https://creativecommons.org/licenses/by/4.0/). 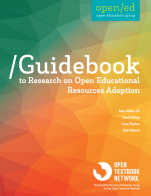 OER Research Toolkit (including Surveys) by John Hilton III, David Wiley, Lane Fischer, Rob Nyland, Open Textbook Network is licensed under a Creative Commons Attribution 4.0 International License, except where otherwise noted.